I have downloaded an eBook that doesn’t open up. How do I open and read the eBook? If you have received a .acsm file that doesn’t open up automatically, it means that Adobe Digital Editions is not already installed on your system. In this case, save the file received and download Adobe Digital Editions. Once the download is complete, open the .acsm file. It would automatically get opened in Digital Editions. This is a generic error caused by your firewall blocking the port and not allowing Adobe Digital Editions to download. 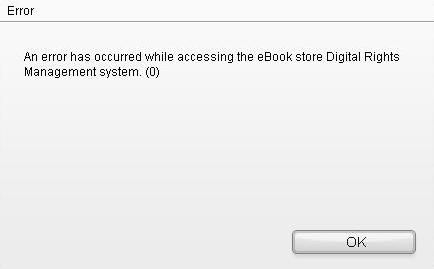 If you receive this error message while trying open an e-book with Adobe Digital Editions, check your firewall settings to make sure the standard port 80 is open. I’m not being able to access my eBook on Digital Editions installed on other machines. What could be the reason behind it? Make sure that Digital editions is properly authorized as mentioned above. Protected items that you download with Digital Editions can open on up to six computers and mobile devices provided they are properly authorized. If you have already opened your protected book on 6 computers and mobile devices and you are trying to open it on a 7th device, you will not be able to do so. In this case, please open your eBook on the last 6 devices/computers. Why can’t I print and Copy my ebook from Digital Editions? Normally content is protected for print and copy access. If content is open in Digital Editions, go to Reading->Item Info to find out access restrictions. If print and copy is not restricted and you are still not able to solve the issue, send an email to Antrik ExPress Support. After downloading ebook, I got .acsm file but it doesn't open with Adobe Digital Editions, what should I do? Book is downloaded first and then Adobe Digital Editions is installed. ADE is not installed properly. Sometimes firefox browser creates problems. Once you have installed Adobe Digital Editions, right-click the urllink.acsm file. Select 'Open With', and choose 'Adobe Digital Editions'. Click 'OK'. Adobe Digital Editions opens and downloads the eBook. If you have already installed Adobe Digital Editions before downloading the ebook, then you may need to adjust your computer's file associations so that the Adobe software opens the .acsm file type. Go to Start > Control Panel > Default Programs > Associate a file type or protocol with a program. The 'Associate a file type or protocol with a program' dialog box is displayed. Under the 'Extensions' heading, select '.acsm' and click the 'Change program...' button. The 'Open With' dialog box is displayed. Click the 'Browse...' button. A second 'Open With' dialog box is displayed. Click 'Open' to associate .acsm files with Adobe Digital Editions. Double-click the 'urllink.acsm' file you downloaded. Adobe Digital Editions opens and downloads the eBook. Open 'My Computer' and from the menu bar select Tools > Folder Options and click on the 'File Types' tab. Select '.acsm' and click the 'Change' button. In the list of programs displayed, click on 'Adobe Digital Editions', then click the 'OK' button. 'Control-click' the 'urllink.acsm' file and select 'Get Info'. The 'urllink.acsm Info' window is displayed. Expand the 'Open with:' section and click the 'Other...' drop-down. In the list of programs displayed, select Adobe Digital Editions. Check the 'Always Open With' checkbox to set the Adobe software to always open .acsm files. Click the 'Add' button. The 'urllink.acsm Info' window is displayed. This issue appears to be caused by a failure in the process of moving your books from anonymous activation to Named activation. Disclaimer: The following solution involves the Windows System Registry. Editing or manipulating the registry incorrectly can result in serious system damage, which may require reinstallation of the operating system. If you are not comfortable editing the registry then it's best to take your machine to a professional. If you choose to proceed it is essential to create a complete system backup and a Windows System Restore Point before proceeding. Antrik ExPress cannot be held responsible for damage resulting from this information. Restart Adobe Digital Editions. You will be asked to re-authorize. Follow the authorization prompts. Be certain to use the correct AdobeID and password to authorize. Why Error encountered when activating Digital Editions or accessing an eBook "Adobe DRM Error". Solution 1: If you changed the clock on your computer, then set it back to the actual time. Any DRM protected books that you downloaded or read while the clock was set incorrectly will not be available to you until the actual clock time reaches the incorrect time to which your clock was set before you fixed it. Solution 2: Enable firewall, antivirus, or proxy software. Firewall, anti-virus, and proxy software can intercept the activation request from Digital Editions to the activation server. If you are receiving an error beginning with E_ADEPT_IO (such as 'E_ADEPT_IO ActivationService Info Error%20#2032') then your machine is not allowing the connection to the activation server at http://adeactivate.adobe.com/. To resolve this issue modify your firewall or other software to allow your machine to connect to the activation server at http://adeactivate.adobe.com/. For all other issues, send an email to Antrik ExPress Support. If you attempt to open or fulfill an Adobe Content Server 3 eBook (i.e. 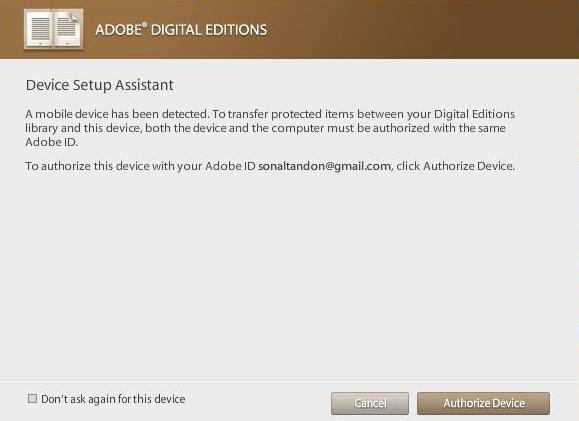 Open an ETD file) with Adobe Digital Editions version 1.7.1, this message will appear. The eBook distributor for the eBooks in question may not have migrated to Content Server 4 and fulfilling their Content Server 3 eBooks are no supported from April 1, 2009. Can eBooks that I have already borrowed from a library be transferred to another machine? Digital Editions 1.5 and higher will detect borrowed eBooks and display in the “Borrowed” bookshelf. 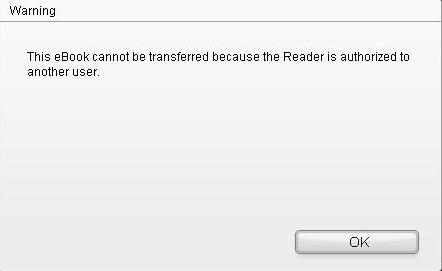 However, if you borrowed an eBook with Acrobat Reader or Digital Editions 1.0, you cannot transfer that book to another machine. You will need to return this book and re-borrow it again with Digital Editions 1.5 and higher in order to transfer it. This is most often caused by the problem with your Internet connection or browser. Please contact your Internet Service Provider (ISP) or check your browser to make sure it is working properly. When you download a PDF or an epub, the Adobe activation records timestamp information from the Adobe activation server. This information is stored inside the book. When you attempt to open the book, this information is compared to your current system information. If your system has an incorrect time/date/time zone, then the activation server disallows the request and you cannot read the book. Carefully check the machine's system time, date, and time zone to be certain they match the time/date/zone when you purchased the PDF or epub. In most cases this will resolve the error. Connect Sony Reader device to the computer via USB cable provided with device. Once detected, auto installation of Sony Reader software (“Reader Library”) is done and following message is displayed to the user. 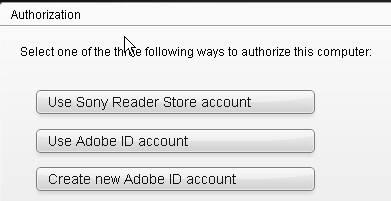 Make sure Adobe Digital Edition (ADE) should be authorized with valid Adobe ID otherwise the books fulfilled in ADE will not be accessible through Sony Reader. 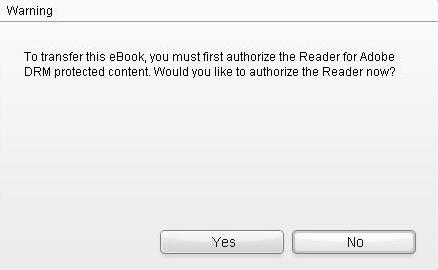 If user authorizes as per above screen, then Sony reader should be also authorized with same credentials. Please note that Reader library and Sony Reader device MUST be authorized with same Adobe ID as ADE.